Ahhh...Thanksgiving. A day to give thanks for what we have and spend time with our loved ones and run a road race before sitting down to a large meal. The turkey trot has become the most popular type of road race in America. Be it a 5k, 8k, or longer, the tukey trot has become as much a part of the American Thanksgiving tradition as a turkey dinner or pumpkin pie. The turkey trot is often the first race that many runners ever complete, myself included. 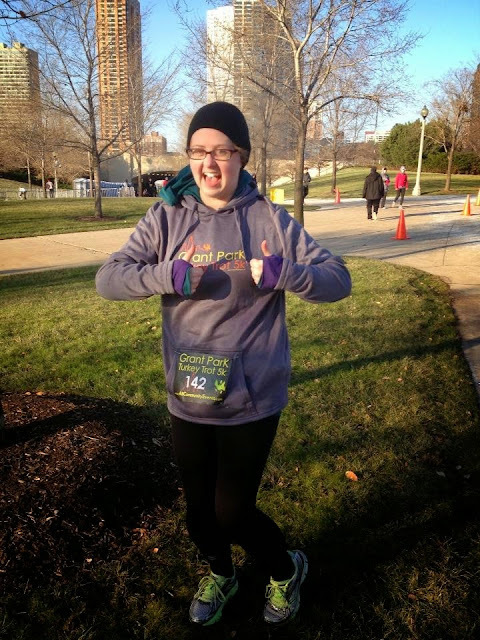 Me at my very first race, The Grant Park Turkey Trot, in 2013. Turkey trots are great for new runners because they aren't nearly as intimidating as other races can be. They tend to more about having fun and being part of a community than about being super competitive. They are family friendly events, and you see runners of all ages, sizes, and abilities, which is always a win in my book. This year, I ran the Art Van Turkey Trot Chicago 5k on Thanksgiving morning. When I woke up that morning, I considered skipping the race completely. It was cold and windy, and I was exhausted and looking forward to a rare day off. Luckily, the race had a later than usual start time, so I had a good chunk of the morning to drink my coffee and rev myself up enough to get out the door and head to the race. It was a grey, cold, windy day in Chicago, and though I thought I only gave myself enough time to get to the race site, check my bag, and then start the race, I found myself at the race site incredibly early thanks to a much shorter than usual wait for the train. Once I got off the train at Diversey, I headed east to the park, where it was easy to find the race site, even if you hadn't read through the participant guide. Just follow all the other people dressed to run and look for the giant turkey. I had too much time to kill before the race and foolishly checked my bag too early. I was freezing! I knew I would warm up once I started running, so until the race began, I just had to keep moving. The race offers day of packet pick up, but I had been able to make it to one of the early packet pick up days and didn't need to bother with it. When it was announced that it was time to head to the corrals, I made a quick stop at the Great Chicago Food Depository truck to make my donation and then joined the crowd in the corrals. The race sold out, being capped at 8000 runners, so the corrals got pretty crowded very quickly. It appeared that I was not the only person who arrived early. The corrals were self seeded, which is always a mixed bag. Despite corral entrances being clearly marked with signs stating the estimated pace, it was obvious that people were lining up where ever they pleased. The last corral was specifically for those who planned to walk the race, but there were numerous people in corrals ahead of me who were clearly not going to running, being dressed in jeans, boots, full winter coats, scarves, etc. No matter what pace you run/walk, you deserve to participate in races. I can't stress that enough. I hear too often from people who feel like they can't run races because they are too slow, or that they don't feel welcome if they want to walk the course even if the race has a corral for walkers. As long as you are able to complete the full distance, then you can and should participate. But please, for the sake of everyone involved, put yourself in the appropriate corral if the race is self seeded. If you are planning to walk the race, then you don't belong in the 9 minute per mile corral. By moving up to corrals where you can't keep pace with those around you, you put yourself and others at risk and create an obstacle for those behind you. I put myself towards the back of the 11 minutes per mile corral. I averaged 12:40 at my last race early in the month, but had been working hard and hoped to be closer to 11:30 minutes per mile this time around, having finally achieved that on a couple of runs earlier in the week. There was a lot of waiting around in the cold, as they smartly did a staggered start, releasing each corral after the one before had enough time to not create a dangerous back log of runners on the path. Using the lake front path tends to be the go to for races in Chicago, but it is extremely narrow in places and can make it tricky to maneuver around others in a crowded race. It also isn't allowed to be closed to the public, so you often have to deal with random/unhappy folks who were unaware that there was a race using the path and weren't prepared to deal with the crowds during their regular run or walk. Unfortunately, many of us had to deal with finding our way around slower runners/walkers almost as soon as our corral was released. With the race being sold out, the 5k course never really opened up and allowed for any breathing room, because it was so jam packed with participants. It can be frustrating, but with races like this, you have to remind yourself that it is really meant to be a "fun run" and so many of the participants are new to running and may not know proper race etiquette. A simple"excuse me" is all you need much of the time to create a hole big enough in a group for you to squeeze through. I was very pleased with my effort as I hit the first mile marker. I had found a comfortable pace very early and was finely starting to feel warm. I had once again chosen to run by feel and was prepared to walk, if needed. I kept waiting for the tell tale tingling in my foot that always eventually led to numbness, but it thankfully never came. I hit the second mile marker still feeling good and knowing that I was getting closer to the finish line. There was plenty of bobbing and weaving through the course, finding my way around folks who were walking, but soon the finish line was in sight. For the first time in a long time, I was able to finish a run with no walking! Hooray! And I ended up with a slightly better finish time than I had planned. My final time was 34:57, giving me an average pace of 11:15. There were plenty of snacks at the finish line: water, Gatorade, popcorn, apples, and mini bags of candy corn. There were also tents with mini pumpkin pies (delicious), warm apple cider, and beer. As soon as I stopped running, the cold returned. Despite being elated to have had my best finish time in almost a year, I ignored the beer tent and went straight to gear check to get my bag, which contained a coat and scarf. I would have loved to stay for the post race festivities (they had music and lots of games, such as turkey bowling), but I was ready for a hot shower and a real meal. Despite my initial bad mood, I had a lot of fun at the race and will probably run it again next year. I was extremely happy to see my hard work pay off in such a big way when it came to my finish time, having shaved almost 5 minutes off my 5k time in just a few weeks, so I have a bit more hope for the future than I did at the start of the month. Running the 5k was a great way to start the day because it got me moving and out of the house for at least a little while. Once home, the rest of the day consisted of cozy pajamas, kitty cuddles, Netflix, and plenty of yummy food. All in all, it was a great Thanksgiving.